Spacious condo in the heart of it all! This is an elegant 3 bedroom condo that features unrivaled views of gorgeous mountains on peak 10, 9 and 8 as also picturesque Maggie Pond! You are located in the most convenient location as it is a true ski-in/ski-out – you can see a Quicksilver Chairlift from your balcony. The interior of this gorgeous condo not only gives you a feel of the mountain vibe with the wood décor, but also a sense of luxury. The design features hand-painted artwork, high-end furnishings, rock granite countertops, and a stunning rock fireplace that all come together to create an unforgettable mountain escape. Massive windows and sliding glass balcony doors give the unit a spacious feel and also an abundance of natural light. While relaxing in the living area or on the main balcony, you will enjoy access to some of the most spectacular scenery – this unit boasts the best views in the entire village. With three bedrooms, two full bathrooms, and enough bedding to comfortable sleep ten adults, this 1,392 square foot unit is guaranteed to please families and friend groups. You will find that the condo comes stocked with all of the items essential for a great vacation: Central heating, a gourmet kitchen that is fully stocked with plate ware and cookware, multiple flat-screen TVs with cable and DVD players, high speed wireless internet, and more. Each of the three bedrooms features plush sleeping arrangements and access to one of the unit’s private balconies. 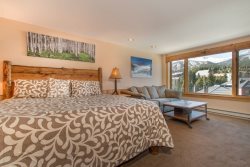 The master suite guest will enjoy a queen bed and views of Maggie Pond/ Quicksilver Chairlift while guests in the spare queen bedroom and two double bedroom will have views of the ski school and plaza. The double vanity guest bathroom provides ample space for busy mornings and also provides great views of the ski runs. After a day on the slopes, you can choose to enjoy your meals around the beautiful wood table in the adjacent dining area, with seating for 8 people, or at the barstool seating at the kitchen counter (seats 4). The condo was great, perfect location, lots of room, better stocked than most condos we have rented. we got there early and since the place was already ready, they were super nice and got us in right away (especially important as it was our 2 year old's nap time and she was melting down). Such great service overall! Great place, great location, same building as ski school for the kids, super well stocked. Excellent communication taking phone calls and answering questions. Very friendly and helpful staff. Great location; spacious condo; very clean and well appointed. The woman who checked us in was extremely helpful and friendly. All calls and questions were promptly answered in a courteous manner. Great location. Well appointed property. Loved our vacation. Thank you. Cannot beat this location - close to the lifts, ski rental shops, bars, and restaurants. No need for a car as everything was within walking distance. The unit was spacious and clean. The folks at Ski Colorado Rentals were incredibly responsive, helpful, and attentive to our group's needs. Really positive experience, would absolutely come back. Perfect for Our Group Getaway. Cannot beat this location - close to the lifts, ski rental shops, bars, and restaurants. No need for a car as everything was within walking distance. The unit was spacious and clean. The folks at Ski Colorado Rentals were incredibly responsive, helpful, and attentive to our group's needs. Really positive experience, would absolutely come back. Great condo right at the base of the mountain where the bunny slope is, and only a short jaunt from Main Street. We had to book last minute due to a mixup with our planned lodgings, and they were able to accommodate even late on a Friday. Very Modern & Clean. The views are amazing from each room! A very beautiful Condo! Everything inside was perfect! We started a fire each night and enjoyed the amazing views! The bedrooms were very comfortable and beds comfortable! We enjoyed the activities at the pond below us and restaurants in walking distance. We sure enjoyed our time here. We felt at home the minute we walked in & my daughters baked cookies in the early evening & we had fresh baked cookies while watching our DVD Movie. We will come back here for sure! LOCATION, LOCATION, LOCATION! If ski out ski out is your goal, you will love this unit. We didn't have or need a car. Make one stop at the grocery on your way in and you're set for the week; walk to everything. Booking, check in and owner follow up were flawless. Great experience and well equipped condo. right in front the mountain, just perfect!